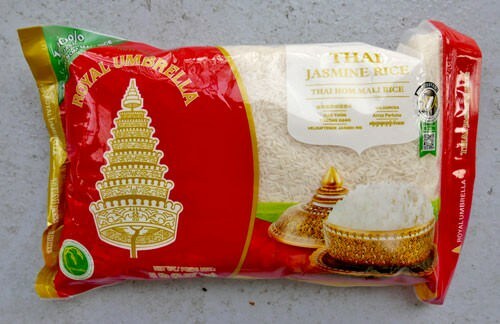 For the first time, Royal Umbrella is offering a convenient 5# bag of New Crop Thai jasmine rice, just arrived today. With ziplock seal. New Crop 2019. We sold too much of the non-salmon Tom Kha over the holidays, please help us with this delicious version so we can make another batch. Lobo is a pioneer in the development of ready-to-eat meals made with the finest ingredients and technology. Their instant pad Thai packet includes sauce, crushed peanuts, and instructions. At $2.59 it's quite a deal. Made in Thailand. We just launched this last week, here it is in case you missed it. Our favorite Kiwi knife because it's so useful, not just in the kitchen but as a scraper in the shop, as a painting tool, you name it. We imported several hundred from Kiwi, offering at $4.25 is ridiculously inexpensive for a knife like this. Just imported from Thailand's 'Hand Brand'. New package has resealable ziplock. Reg price $3.29 get some for $1.50 this week only. We have really nice fresh galangal this week, and the Thai chillies & lemongrass look good too. Order anytime today or tomorrow and you'll have this fresh kit delivered by weekend.